SYDNEY (AFP) - Hundreds of firefighters were on Monday (April 16) battling a large bushfire that was raging near Sydney suburbs, with authorities saying it was "miraculous" no houses had been damaged and no one had been injured. The blaze has burnt through more than 2,430 hectares so far, with some locals evacuated from their homes. 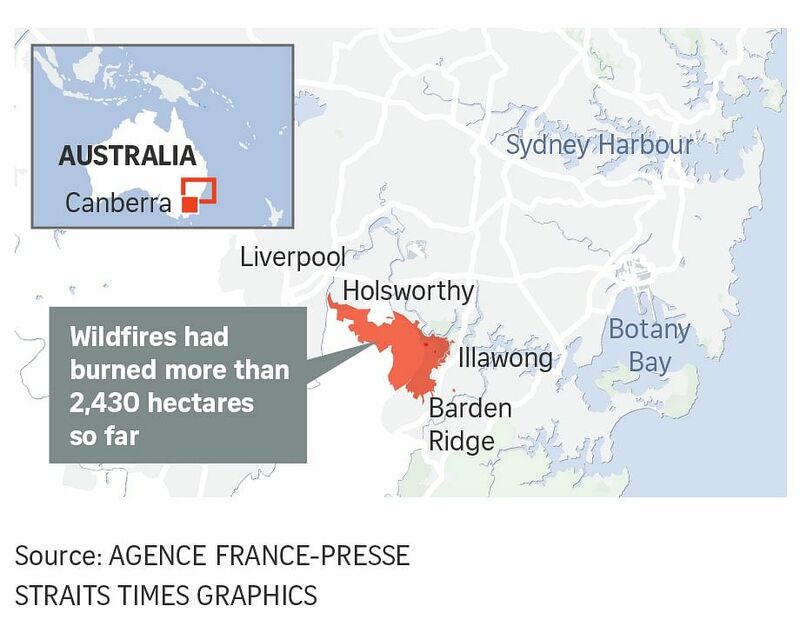 Despite the fire's size and its proximity to several suburbs, with some locals evacuated from their homes, no properties were known to be lost, the New South Wales Rural Fire Service said. "It is absolutely miraculous that we have not lost any lives and virtually no property and this is because of the hard work and dedication and heroism of our fire services," the state's acting Emergency Services Minister Mark Speakman told reporters on Monday. NSW Rural Fire Service Commissioner Shane Fitzsimmons said the only damage reports were of fences and a children's playhouse caught in the fire's advance. Conditions had improved on Monday as winds eased, with firefighters working to slow the spread of the flames. They also conducted controlled burns overnight to clear land that could be combustible. Commissioner Fitzsimmons said it would be "sickening and reprehensible" if the fire was discovered to have been arson. "When you add on to that the unseasonably hot couple of weeks we came into autumn and into the month of April, we were talking about temperatures well and truly in the 30s (degrees Celsius), which were unprecedented," Comm Fitzsimmons said.